John, Welcome to Homeschool Authors. Tell us a little bit about yourself. Thanks, Sarah, I'm happy to be here. I'm a Christian young fellow with a passion for reading and writing good books. I'm the youngest of three and uncle to two. I began my life in New Jersey before moving to my current home in San Antonio, Texas. In my day job I work for my publisher handling customer relations, marketing, editing, and more. In my night job I pound a keyboard and spin story-webs in which to entrap my characters. If there was a family thinking about homeschooling, what would you share with them about your own experience? My experience has been fantastic. My family's decision to homeschool was based upon conviction, meaning that my parents believed that my education was their God-given responsibility, and they sought to fulfill that duty with diligence and love. Splendid side-effects of this decision included strong family relationships, the flexibility to focus on subjects I most enjoyed (writing), and the chance to learn real-life skills in the business world. How did being homeschooled affect your writing? There are many ways. I'll list two. 1. I got to do lots of writing. 2. My parents encouraged me to read great books, both fiction and nonfiction. You are what you read. I see you write historical fiction. What is your favorite time period? Victorian England (1837 - 1901). It's not a perfect era, but it's full of manliness, courage, and the concept of gentlemanly conduct. Probably reading. I'm one of those annoying fellows who say that they can't remember disliking writing. What inspired Brothers at Arms? I wondered what would happen when two twins with opposite personalities are educated in completely opposite ways and then thrown into a dire situation involving danger, an Inca treasure-hoard, and a mysterious enemy. Two antagonistic English brothers guard a Spanish girl with a centuries-old secret. Who will enjoy Brothers at Arms? Guys and gals around the ages of 8 - 16 who enjoy adventure. 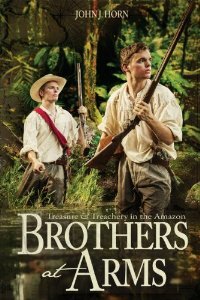 You can read a full description and sample chapter and then buy Brothers at Arms: Treasure & Treachery in the Amazon from my publisher, Vision Forum. If someone enjoys Brothers at Arms, what other books do you recommend? 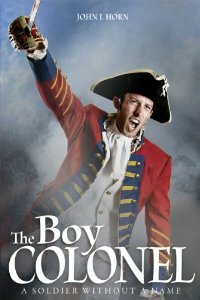 The Boy Colonel: A Soldier Without a Name. I happen to think it's a pretty good read, though the fact that my name is on the cover may have something to do with that. I grew up on what I call the "classic boys' adventure authors." R.M. Ballantyne, G.A. Henty, Jules Verne, James Fenimore Cooper, Robert Louis Stevenson. I can't recommend every author carte blanche, but many of their books grace my favorites list. One author living today whose books I respect and enjoy is Douglas Bond. 2. Encourage, instruct, and delight young people. 3. Indulge my passion for creating stories. 4. Honor the legacy of the authors I grew up with. As an epilogue to this fun interview I'd say: Thanks for having me. Buy my books. And, remember that books are but splotchy shadows compared to The Book, the Bible, which should be our guiding star. Wow! Your books sound intriguing! Keep it up! Great Interview! John, Thanks for the encouragement and godly example to pursue writing for the glory of God! I hope many people are blessed through your books!